Spinning disks manufacturers are slowly but surely going up the stack with HGST launching an archiving system called the Active Archive System which is based on technology from its Amplidata acquisition. The storage solution uses about 600 8TB drives to deliver a staggering 4.7PB (that's 4.7 million Gigabytes) of capacity in one 42U rack with a whopping 3.5GB/s bandwidth per rack. 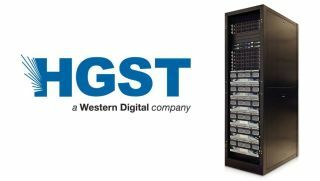 Despite an eye-watering price tag of $849,000 (about $180 per TB), HGST claims that its helium filled hard disk drive technology will allow it to deliver a TCO up to 70% less compared to "alternative OS/commercial OSS" solutions. That translates into a 300 to 500% improvement in density and power efficiency, with power consumption being as low as 1W/TB (still a sizeable 4.7kW for the whole rack or 8W per drive). SMR-enabled 10TB models are likely to be introduced later this year which will improve density even further. Archrival Seagate has another scale-out solution called the Kinetic Open Storage platform.